This is third in the series of food reviews, where we will be taking a closer look at Frugal Foods that are also very nutritious. Yesterday I extolled the nutritional value of beans, you can find that article here. Beans are a great food to add to nearly any meal, but using them requires proper planning, particularly if you plan to use dried beans. Beans have a very long shelf life, whether you purchase dried or canned, making them a great pantry food to keep on hand. Deciding on whether to purchase dried or canned depends on a lot of different things. How you will use them, what you can afford, how much time you have and if you have a taste preference. Our family keeps both on hand and uses dried whenever possible simply because they are cheaper, and because they have not been super heated in the canning process, they retain much more of their nutrients. Be sure to wash and sort your beans before soaking or cooking, this is to be sure that any foreign matter or less than perfect beans do not make it into the final product. You will want to soak your dried beans before cooking, this process with rehydrate your beans making them more tender, it will also help to release much of the gas that is commonly associated with beans. The longer you soak beans and the more you rinse them the more gas that is released and the less of an issue it will be for you. Beans should be soaked at least over night and rinsed 2 to 3 times for best results. 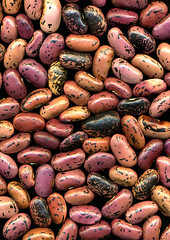 Beans triple in size so for every cup of beans you will want to add at least 4-5 cups of water. One cup of dried beans = three cups cooked beans. If you forgot to soak your beans overnight don’t panic, you can use the quick soak method, which works just fine. Add your beans and water to the pan keeping in mind the bean to water ratio above. Bring the beans to a boil and and let boil for a few minutes, then cover, remove from heat and let sit for at least one hour, four or more hours is better. Be sure to sure to rinse your beans after soaking, this water is what is responsible for the gas factor in beans, which can be greatly reduced by rinsing. Your recipe may give you instructions from here to cook your beans, but if the recipe calls for canned beans, your beans are not yet cooked enough to replace the canned beans. Place your beans back in a large pot, and fill your pot with water, again make sure your water to bean ratio is at least 2 to 1 as they will still absorb a good amount of water. Beans will take one to two hours to cook at this point, keep checking them, when they are fork tender they are ready. You can add a bit of fat to the cooking water to reduce foaming if you want, but a large pan and watching your beans closely will prevent any boil overs. You can add seasonings such as garlic, onion, (whole or powered) or herbs to your cooking water but save salt or any acidic flavorings till the beans are completely cooked, adding these items can cause the beans to take longer to cook, especially at high altitudes. Extra cooked beans can be frozen or canned (if you have a pressure cooker) for later use. Tomorrow I will share my tried and true bean recipes to get you started.